• After starting the camera and adjusting the light sensitivity, Solar Modulator will start sending out MIDI events. 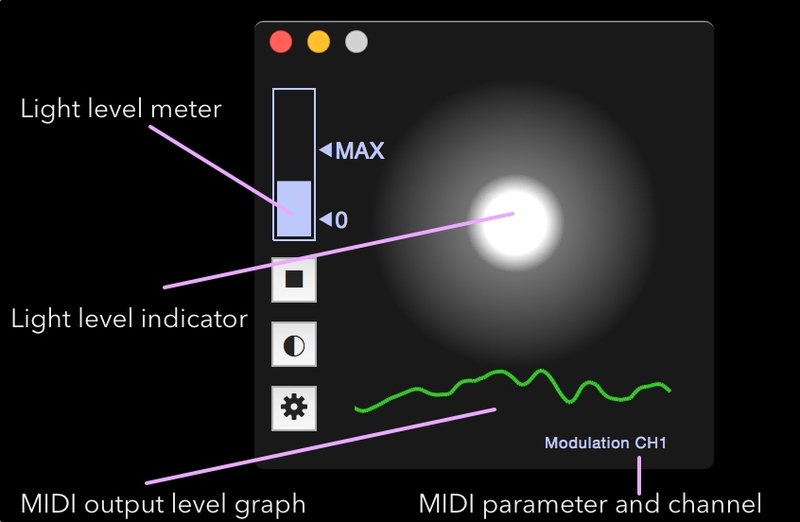 • Move the 0 and MAX sliders to adjust how the amount of light maps to the MIDI events. • To re-adjust light sensitivity, press the sensitivity button (the second button). • To change what sort of MIDI is being sent, either click the settings button or right click the dock icon to bring up a menu. • More information about how to use Solar Modulator can be found in the user guide (Help->User Guide). If there are short audio glitches while using your DAW and Solar Modulator, it may be due to the DAW's real-time audio processing and Solar Modulator's real-time camera analysis colliding. This can be fixed by increasing the audio buffer size in the DAW (see DAW documentation for details).